Richard Francis Apeh, an indigene of Otukpo Local Government of Benue State, Nigeria, holds a Bachelor of Science Degree in Computer Science from Benue State University, Nigeria. 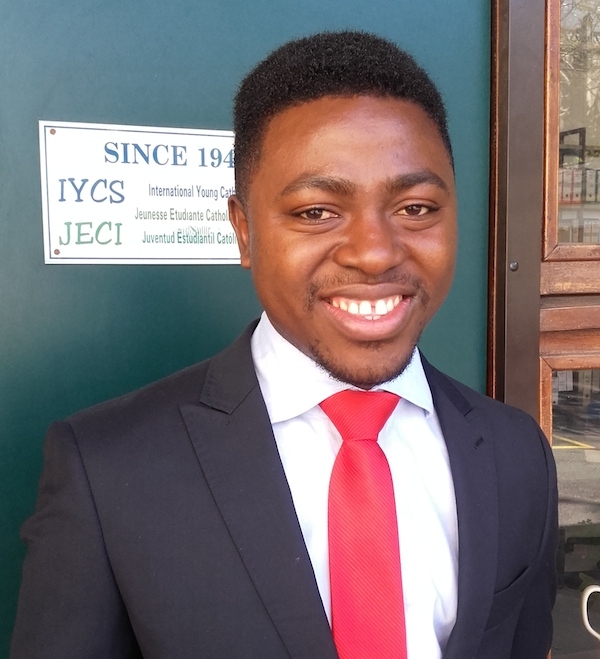 In 1999, Richard became a member of the IYCS at Government Day Secondary School, Otukpo, in his Nigerian hometown. The experience of rediscovering the love for God through fellowshipping with other young people would lead him to dedicating his time to the service of God and the youths in different capacities within and outside the Movement. He was made the Sectional Music Director of YCS in his Government day college until 2001, when he transferred to another school, St. Francis College. While in St. Francis College, he served as one of the College Senior Prefects between 2003-2004 and a conductor of the school choir. Same year, he was appointed the Sectional Secretary of his school chapter, and the Otukpo Regional Area Secretary. Upon graduation, he became the President of the set ‘04 of the St. Francis Old Boys Association from 2005 to 2010 and worked as Editor-in-chief of Shalom Magazine, a publication of YCS Otukpo Diocese. In 2005, Richard enrolled into Benue State University, Nigeria, to study Computer Science. While at the University, he served as YCS Music Director, YCS Sectional President, National Vice President YCS Nigeria, and Chapter Secretary of International Movement of Catholic Students (IMCS Pax Romana). Even with several responsibilities, Richard excelled in his academics. In his final year, he was the course Rep and Chairman of Mathematics and Computer Science Album and graduation dinner committee. Between 2011 and 2015, he held the post of the National Coordinator YCS Nigeria. He was a member of the National Association of Catholic Corps Members. He also presided as the National Coordinator of the Young Missionary Movement of Nigeria, YOMM, and the pioneer member/co-chair of the Youth Wing Nigeria Interreligious Council, NIREC. Outside the Movement, Richard has worked in different establishments holding various positions, which includes; a teaching job during his gap year at Holy Innocent Secondary School, Otukpo, where he taught Chemistry and Biology in the senior classes, and Integrated Science, English and Christian Religious Studies in the junior classes, an appointment as the Admin Secretary of Pontifical Mission Societies of the Catholic Diocese of Makurdi, working as an Intern with Pacent Technologies Ltd, Awka, Anambra State, Nigeria, and a full time job as a Data Analyst with the Presidential Implementation Committee on the Alienation of Federal Government Landed Properties, Abuja, Nigeria. He was a member of the National Missionary Council of Nigeria and a member of the Episcopal Commission for Mission appointed by the Catholic Bishop Conference of Nigeria. He represented YCS Nigeria as an executive member of the Youth Wing Christian Association of Nigeria. He is a serving member of the Economic Think Tank of the Catholic Television Abuja (CTV), and has been a trainer at various IYCS leadership events and now on the IYCS Psychosocial Conflict Analysis Tool and contributed to the drafting of the student version of the tool. His love for music has seen him in as a member of several musical groups such as, the Franciscan Orchestra; a group he co-founded, the All Saints English Choir Otukpo, the Abuja Choral Ensemble and now La Chorale Beaugrenelle, Paris. Richard has exceptional qualities such as great leadership and management skills. He is creative, a team player and always looking to challenging and improving himself. He is tolerant, humble, and honest in his dealings and service to humanity. His hobbies include, singing, teaching, reading novels, and going to the movies.